What is the ICA~I ? The purposes for which the International Chiropractors Association of Indiana is formed are to promote and to protect the interests and the general welfare of the duly licensed chiropractors and state of Indiana, and to enhance the chiropractic profession through organized leadership and advancement of the chiropractic profession. To be an advocate for Indiana doctors of chiropractic, chiropractic patients, and the chiropractic profession to the government, the public, the business community, and the community a third party payors. To promote and the science, philosophy, and art of chiropractic as the healing profession that emphasizes the importance of the relationship between structure, primarily the spinal column, and the nervous system, and how that relationship affects health and function. 1. 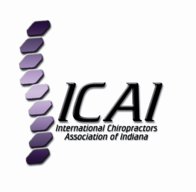 ICAI is the voice and leader of conservative chiropractic in Indiana. We maintain that the primary goal of chiropractic is to detect and correct the vertebral subluxation. 2. ICAI will perpetuate and champion the vitalistic (Innate) philosophy of health, recognizing that the human body is a self-developing, self-regulating, and self-healing organism. 3. ICAI maintains that the objective of Chiropractic is not just the "treatment" of pain, but the correction of the vertebral subluxation and the interference that prevents the organism from expressing its full Innate and genetic potential. 4. ICAI will continue to provide high quality chiropractic- centered CE seminars for our members and for the chiropractic profession statewide. 5. ICAI will defend the chiropractor’s right to use x-ray and other accepted other non-invasive analytical procedures for subluxation detection and analysis. 6. ICAI will monitor and work proactively to protect the legal and legislative rights and privileges of the practice of chiropractic. 7. ICAI will remain vigilant and prepared to aggressively work to reject attempts by those who would try to incorporate the use of drugs and medications (prescription rights) into the chiropractic paradigm and scope of practice in Indiana. 8. ICAI stands for the right of every Hoosier to maintain the right to choose his or her own doctor and type of health care without being dictated to by a third party. 9. ICAI supports board approved chiropractic colleges and the education they provide through the development of support programs and student scholarships. 10. ICAI believes in promoting healthy lifestyle practices including regular chiropractic care, vitalistic nutrition, exercise, and positive mental attitudes to help our patients to thrive and flourish. – Please Consider Joining Us Today! "Good for Chiropractic - Good for Indiana"